OSAKA - Thousands of people are canceling trips to popular tourist spots in western Japan even though many of their destinations were left unscathed by the recent deadly rain disaster, local officials said Wednesday. Dogo Onsen in Matsuyama, Ehime Prefecture, known as one of Japan’s oldest hot springs, is usually bustling with Japanese and foreign tourists. But a local cooperative representing about 30 hot spring inns found that more than 3,000 people have canceled their reservations at hotels and inns following torrential downpours earlier this month. “Maybe people think that the devastation extends across the prefecture,” said an official at the cooperative. “Simple calculations show cancellations by 3,000 people are equivalent to a financial loss of about ¥45 million ($399,000). If we take the impact on nearby shops into account, the damage is even greater,” the official added. Ehime, Hiroshima and Okayama prefectures were hit hardest by the rain and ensuing flooding and mudslides, which left 223 people dead, according to the National Police Agency. While Uwajima and other southern Ehime cities were devastated by the rain, the damage to Matsuyama was relatively limited, and the Dogo Onsen Honkan bathhouse — designated as an important cultural asset of Japan and a major tourist attraction — is operating as usual. “I was a bit worried, but I came because I called the local tourism association and was told it was okay,” said Maiko Mizushima, 26, who came to the hot spring from Kanagawa Prefecture near Tokyo. “I am relieved to see the damage was more limited than I had expected. I am glad I came,” she added. “We want people to come and think visiting this place and spending money here is a way to support us,” said a Matsuyama tourism official. 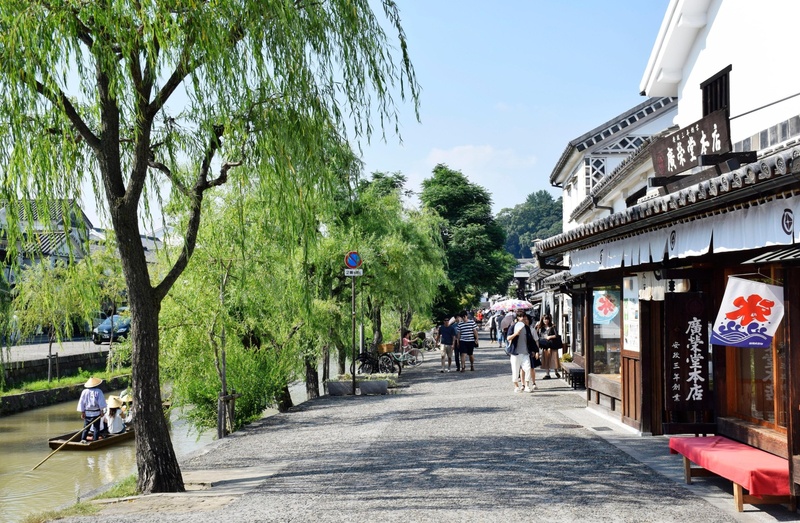 Hiroshima’s Miyajima island, home to the UNESCO World Heritage site of Itsukushima Shrine and its floating gate, has also been affected by cancellations, as well as the historical quarter of Kurashiki, Okayama Prefecture, with its many traditional buildings. “We have seen cancellations of tours and are worried that the impact may persist into the autumn, when the largest number of people come,” said a person involved in local tourism, adding that mud flowing into the sea could obstruct the operation of ferries to and from Miyajima. 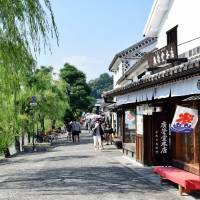 The number of tour buses arriving at the scenic historical quarter of Kurashiki has also halved since the disaster, even though the area is distant from the Mabicho district where more than 4,000 houses were flooded. 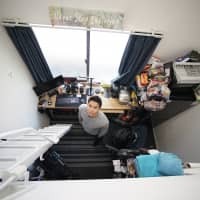 Amid the drop in the number of guests, 51 hotels and lodgings within Okayama have decided to provide food and rooms for free until the end of this month to about 1,000 people with special needs who have been affected by the disaster. The prefectural government will cover the room costs. Washuzan Shimoden Hotel in Kurashiki has decided to take in evacuees including infants, pregnant women, the elderly and people with disabilities, since reservations until the end of August are roughly half the volume typically seen in a normal year. “I was moved by hotel operators who continued to help people affected by the Great East Japan Earthquake and Kumamoto earthquakes despite being affected by the disasters themselves. Now, it is our turn,” said the hotel’s president Hisanori Nagayama. As of Tuesday evening, about 4,700 people were taking shelter at evacuation centers in 16 prefectures, according to the Fire and Disaster Management Agency.